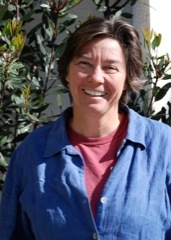 I have been the Director of Ecosystem Management for UCSB's Cheadle Center for Biodiversity and Ecological Restoration (CCBER) since 2005. As the manager of the campus lagoon and other open space areas on campus, I have been active in pursuing opportunities to improve water quality and provide habitat through bioswales and treatment wetlands. I received my PhD at University of Hawaii-Manoa, my masters from University of Wisconsin-Madison and my undergraduate degree at Stanford. I have been a change agent on the landscape committee since the inception of UCSB's sustainability commitment and worked towards promoting sustainable, non-invasive, low water landscapes that celebrate UCSB's unique location within a matrix of natural habitats and wetlands.